In the late 80’s and early 90’s, a junior team in the middle of wheat country Canada seemed to become the heavyweight champs in producing NHL caliber hockey enforcers. The long list that donned the blue and yellow of the Saskatoon Blades included fighting legends Joey Kocur, Darcy Hordichuk, Dave Brown, Wendel Clark and more recently, the late Wade Belak. However, in 1987 the Western Hockey League squad assembled one of the best one-two punches that not only the team ever seen but one of the best the National Hockey League ever set their eyes on. 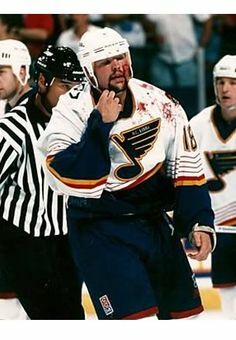 Both weighing in at over 200 pounds and a tall 6 feet, Tony Twist and Kelly Chase took no prisoners when they took to the ice. Twist’s reputation around the league was that he threw hammers and he fought to hurt. You had one shot; you better make it worth your while. Chase came into the NHL two years after having led the WHL in penalty minutes with 343. Fun fact: None of those minutes were misconducts; they were all fighting majors. A native of Prince George, British Columbia, Twist is not only a legend of the St. Louis Blues but of the ill-fated Quebec Nordiques as well. You can tell from his stats he was only there to do one thing: intimidate. Many nights were spent bloodying up opponents who dared to take a run at the superstar player on Twist’s side. A student of the enforcing game, Twist would watch tapes upon tapes of fights; trying to master his art in time for the next game. You may even say he was obsessed. Chase on the other hand had a little bit of skill bestowed upon him. Not much but when you’re throwing punches night in and night out, you’ll take what you can get. Among teaming up with Twist in St. Louis, Chase was similarly involved with another ill-fated team, the Hartford Whalers. Chase took it upon himself to mentor the young players that came in and mold them to the game. 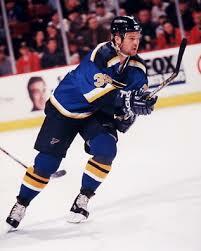 His leadership abilities both on and off the ice gave him the title of King Clancy Memorial Trophy winner in 1998. His hard work not going unnoticed. The two did have the chance to tango when they were not becoming brothers on the St. Louis Blues. Chase having just been acquired from the Whalers was facing Twist while he was donning the blue and yellow on night. Behind the Blues bench was “Iron” Mike Keenan; barking orders at Twist to take Chase down a notch. The two did what they had to do as it was mostly water under the bridge but one hell of a tangle they went through. Tony Twist’s career was cut short just as he was starting to become the undisputed heavyweight champion if you will. During the 1999 offseason, Twist was thrown from his motorcycle after being cut off. After beating off internal bleeding, a broken and dislocated pelvis, plus ligament damage to his left knee, Twist figured a message was being sent that he better hang up the skates. After all, one wrong hit during the season could mess his leg up bad. With 1121 penalty minutes in 445 games, it begs the question of what Twist could have been had he not been injured. Kelly Chase played on a little under half a season longer after coming back to St. Louis after a very short stint with the Toronto Maple Leafs. When all the smoke had settled, Chase racked up 2017 penalty minutes in 458 games over a 12 year NHL career. Some of you may remember him on CBC’s Skating With The Stars where hockey players teamed up with figure skaters in an ice dancing competition. Noted around the league as the “Bruise Brothers”, Twist and Chase are lined up in my Enforcer Hall of Fame side by side. Seeing both of these gigantic men come flying down the wings with a look of determination, fear and willingness to inflict considerable amounts of pain to their opponents gives them the respect they very well deserved.